Irish Rail services have resumed following a "tragic incident" on the railway line at Howth Junction this morning. 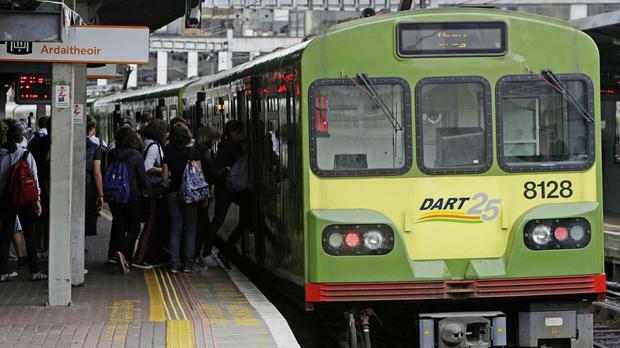 Full DART, Commuter and Enterprise services to resume, Irish Rail confirmed. It is expected delays will remain for a short while but will soon ease. The disruption affected commuters throughout this morning's peak times. Speaking on RTE Radio One's Morning Ireland, Iarnród Éireann spokesperson Barry Kenny said they apologised to customers, but the incident is a tragic one. "An out of service train struck and fatally injured a man at Howth Junction," Mr Kenny said. "There will be major disruption for the entirety of this morning's peak, this means no DARTs operating from Malahide or Howth. "Dublin Bus are accepting rail tickets but obviously with typical volumes there will be significant pressure and capacity. "If commuters can opt for alternative routes, we would advise them to do so." Mr Kenny said they do expect the incident, which occurred at 6.20am, to cause disruption throughout this morning's peak commuter period. He continued; "We have had experiences similar to this in the past, it is not unusual for the line to be closed for two or two and a half hours. "This would indicate disruption right through this morning's peak. "We apologise to customers but the circumstance is a tragic one, and the disruption is unavoidable." Meanwhile, Belfast Enterprise will have Bus transfer between Dublin Connolly and Drogheda.